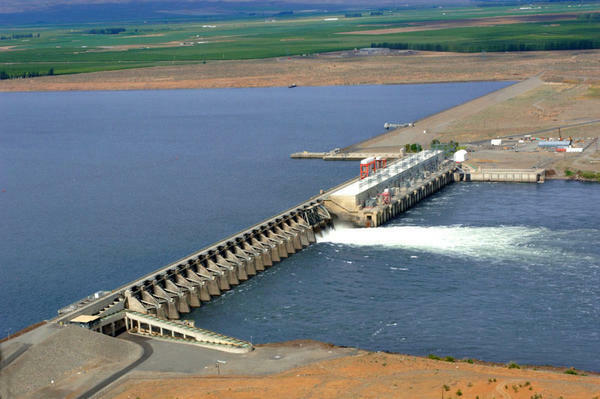 File photo of Priest Rapids Dam on the Columbia River. 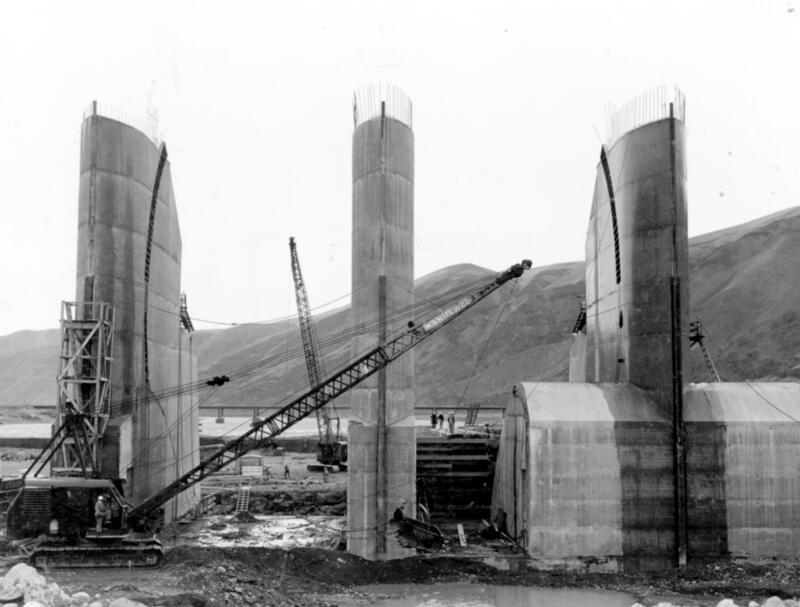 File photo of Priest Rapids Dam during construction in the 1950s. Lift joints are the sections of grout between pours of concrete and steel. The problem is called a "debonded lift joint." Officials from the Grant County Public Utility District, which operates the dam, said the dam hasn’t moved off its base and the structure is holding fast. But it’s leaking a constant four gallons per minute. Behind the dam lies Priest Rapids Lake. It’s about 80-feet deep and stretches 18 miles up the Columbia River. Operators have drawn it down three feet from normal levels to lessen the pressure. They aren’t sure when they will be able to raise it back up again. To figure out just how bad things are, a half-dozen consultants are drilling holes in the grout at a cost of up to $30,000 per day. The federal government is watching over their study. Grant County PUD is hoping for more answers in May. Priest Rapids Dam sits directly upstream from the Hanford cleanup site and the Northwest’s only commercial nuclear reactor, the Columbia Generating Station. It was born after the infamous Vanport Flood of 1948. That event wiped out a town of World War II shipyard workers on the Columbia River. The dam flipped the switch to start making hydropower in 1959 and received a 44-year federal license extension 10 years ago.